Note: A Unified Threat Management serial is required to configure a failover installation. For more information, contact your Smoothwall representative. The Smoothwall’s hardware failover enables you to configure a failover which, in the event of hardware failure, provides all the protection and services your primary Smoothwall usually provides. When configured and enabled, the failover Smoothwall runs in a standby mode monitoring the primary Smoothwall for a heartbeat communication. Heartbeat is the name of a suite of services and configuration options that enable two identical Smoothwalls to be configured to provide hardware failover. The primary system periodically copies settings to the failover unit to ensure that the failover unit can provide a fully configured service if the primary system fails. Note: Settings are copied intermittently and it is theoretically possible that the failover unit will be a few minutes behind configuration changes made to the primary system. If the primary Smoothwall fails, it stops responding to the failover unit’s heartbeat and the failover unit therefore determines that the primary system is no longer available. This occurs somewhere between 0 seconds and the Keep-alive internal time specified when configuring failover. The failover unit then enters a more responsive mode where it monitors the primary system for its revival. It remains in this mode for the length of Dead time you have configured. This stage is designed principally to cope with intermittent failures within the communication system, such as a heavily loaded primary system. Once Dead time has expired, the failover unit awakens from its standby mode and begins re-instating the settings and services allowing it to take over operations from the primary system. Since part of this information includes the IP addresses for each of the primary system’s interfaces, the failover unit essentially provides a drop-in replacement and the transition generally go unnoticed. When the primary system starts to respond again, be it minutes, days or weeks later, assuming that Auto failback is enabled, the failover unit hands over control to the master, de-activates its configuration and services, and returns to standby mode. There are no noticeable differences between administering the Smoothwall used as a primary system, and administering as a failover. There should be little or no need to administer the failover unit on a day to day basis. However, from time to time, you need to install updates. For more information, see Updating the Smoothwall. You must configure a heartbeat interface on the primary system to ensure the connection to the failover system is live. 1. From the primary system, go to Network > Configuration > Interfaces. 2. Point to the interface to be used by the hardware failover master and failover unit systems to communicate with each other and click Edit. Note: The primary and failover unit systems are connected via their heartbeat interfaces on a private network. It is critically important that this network is not congested and suffers as little latency as is possible. For these reasons, we strongly recommend that this connection be a crossover cable. Using a crossover cable also minimizes the risk of failure as it is possible that the switch the heartbeat interface is on could fail. • Use as — Select Heartbeat interface. • Spoof MAC — If MAC spoofing is used, enter the new MAC address. • MTU — Optionally, enter the maximum transmission unit (MTU) value required in your environment. Note: A heartbeat interface must exist on the primary system for failover to work. For a detailed description of how to configure this, see Prerequisites. 1. On the primary Smoothwall, go to System > Hardware > Failover. • Enabled — Select to enable failover. • Auto failback — Select if you want the failover unit to automatically hand back control to the master when the master starts to respond after a hardware failure. The failover unit will hand over control to the master, deactivate its configuration and services and return to standby status. • Keep-alive internal — Set the interval after which the master and failover unit communicate to ensure the master is still working. The default is 1 second. 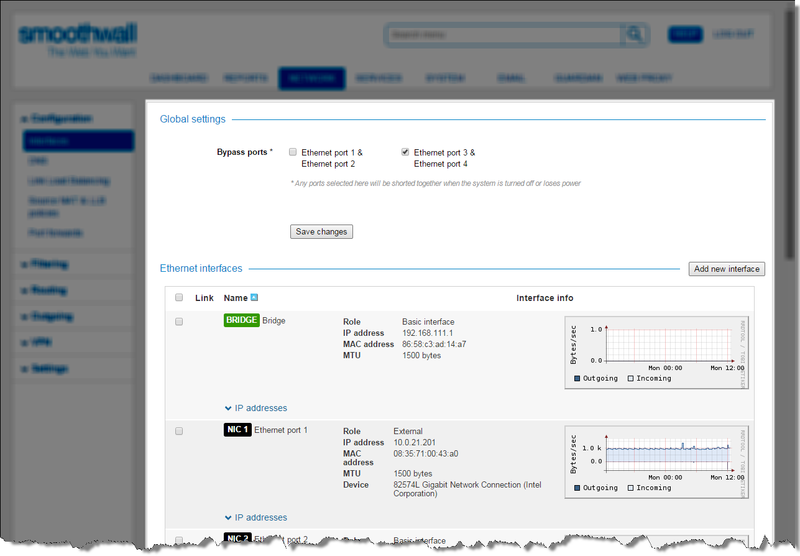 In non-congested networks, we recommend a very short interval which is undetectable in terms of system performance. • Dead time — Specify how long after the failover unit has become aware that the master is no longer responding it should wait before taking over from the master. 3. For the following network configuration, we recommend the network is private and only used by the primary and failover units. 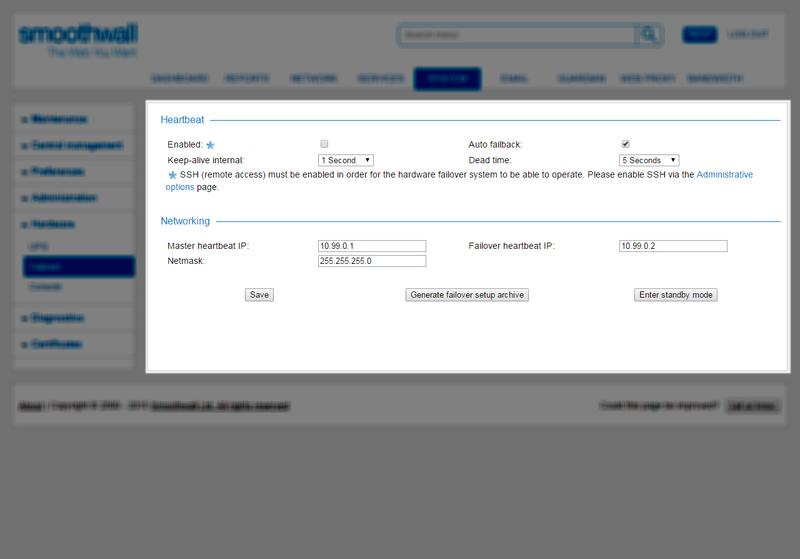 • Master heartbeat IP — Enter an IP address for the primary system. • Failover heartbeat IP — Enter an IP address for the failover unit. • Netmask — Enter a netmask. 5. Go to System > Maintenance > Shutdown. 6. Select Immediately and click Reboot. The browser refreshes back to the login page once the reboot has completed. A failover archive contains the settings required to configure the failover unit to provide hardware failover for the Smoothwall. 1. Go to System > Hardware > Failover. 2. Ensure the failover settings are configured and saved — see Configuring Hardware Failover . 3. Click Generate failover setup archive. The Smoothwall generates the archive and prompts you to specify where to save it. 4. Save the archive on suitable removable media accessible by the failover unit, such as, USB storage media. The next step is to use the archive to implement the failover settings on the failover unit. Note: The size of the failover unit archive varies depending on the Smoothwall modules installed. 50 megabytes is an average size. Implementing failover on the failover unit entails running the setup program and using the restore options to apply the settings. • Install the Smoothwall using the quick install option. For more information, seeUsing the Quick Installation Method. • Select Yes and press Enter. If using Smoothwall appliances, access the failover unit using an SSH client such as PuTTY. 2. On the command line, enter setup to start the Smoothwall Setup program. 3. From the Setup menu, select Restore configuration and press Enter. 4. Select the type of media the archive is stored on and press Enter. You are prompted to insert the media. 5. Insert the media and press Enter. 6. Select the archive and press Enter. The failover settings are installed. 7. When prompted, press Enter to reboot the failover unit. The failover unit will reboot and automatically enter standby mode. Note: For information about installing updates in failover units, see Installing Updates in a Failover System. In order to test failover, you can force the primary system to enter standby mode. 8. From the primary system, go to System > Hardware > Failover. 1. Click Enter standby mode. After a short period of time the failover unit takes over from the primary system. 2. To restore operations to the primary system, from the active system, go to System > Hardware > Failover. 3. Click Enter standby mode. Operations are transferred back to the primary system. Note: If Auto failback is enabled, rebooting the primary system also returns it to active service, and force the failover unit into standby mode. In configurations where Auto failback is not enabled, when the failover unit is in active operation but the primary system has become available again, you can manually failback to the primary system. 1. From the failover system, go to System > Hardware > Failover. 2. Click Enter standby mode to restore the system to normal operations.